What give cuisine in Provence its unique flavour? Alongside its rolling fields of lavender, quaint hilltop villages, upmarket coastal resorts and a beautiful blue coastline, the region of Provence in southern France is home to unique cuisine with incredible flavour. If you’re planning a trip to Provence – aka the Cote d’Azur, or the French Riviera as it’s commonly known as – try not to leave without tasting some of the region’s most traditional dishes. Sounds tempting? Take a look at what gives Provence cuisine its unique flavour? Like the whole of the Mediterranean, the food in Provence is doused in lashings of olive oil. A huge emphasis is placed on vegetables of varying types, grown locally of course under the intense sunshine this part of France enjoys for most of the year. Seafood and copious amounts of fresh herbs blend together to give Provencal food its unique flavour. 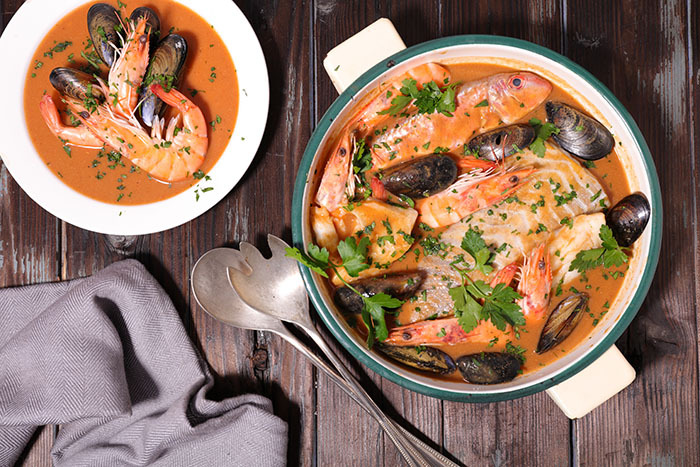 A key regional dish in Provence that’s difficult to miss is Bouillabaisse. This signature dish of Marseille comprises of a tasty broth, delicious fresh fish – preferably at least four different types of fish – crunchy croutons and a spicy saffron garnish known as rouille. Another nutritious savoury staple of the region is daube, a mouth-watering beef stew. Daube was once considered a poor man’s stew but is now served in the finest of restaurants across the Cote d’Azur. The beef is cooked slowly in red wine, alongside garlic, vegetables and herbs. The stew is traditionally served with gnocchi or polenta. It’s not just savoury dishes that have an intense, unique flavour in Provence, as so too does the sweet delicacies served in abundance throughout the region. One such delicacy is nougat, a popular sweet made from egg whites, sugar, honey and roasted almonds. Nougat is especially prominent in Provence at Christmas time but can be purchased in the boutiques, cafes, kiosks and stalls all year round. Consuming such delicious local dishes and delicacies requires an equally flavoursome beverage to accompany a meal. The aniseed-flavoured pastis is one liqueur that’s hard to escape in Provence. Introduced by Paul Ricard, an industrialist who lived in Marseille in the 1930s, this distinct drink is a popular pre-lunch aperitif in the region.